Cobbler Seam Binding Ribbon; Cherry Cobbler Ink; Prismacolor Pencils; Dazzling Details; SU! I'm back with another creation for 613 Avenue Create & our optional twist for you this week is to make a CAS style card. I used the JOY Christmas words digital stamp because I knew it would make this challenge super easy & I was right!!! To see what the rest of the Design Team created, please check out our blog & while you're there; read up on our rules so you can play along with us! I can't wait to see what you come up with! Have fun & happy stamping everyone!!!! 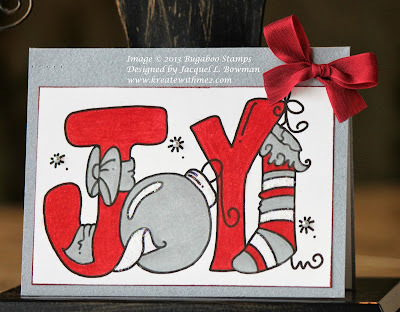 This is a great color combo for a Christmas card! I like how you made the image so large that it covers most of the front, and the little red bow is a nice touch. Great clean design! Great take on a CAS card Jackie! Lots of white space & I like that you went with only the two colors of red & silver-grey! Nicely done! Nice card, I like it :) Thanks for sharing with us at Scrappers Delights. Good luck! Great image and colouring and I love the CAS design! Thanks for joining us at Songbirds! Great color combo! I love it! Fabulous card! Thank you for joining us this week at the Crafty Sentiments Designs Challenge! I hope you play along with us again soon! Great card...Thanks for playing along with us at Di's Digi Design Challenge this fortnight. This is absolutely adorable Jackie...great job. Oh I love this! Fabulous. Thanks for playing with us over at Loves Rubberstamps!!! Oh Jackie, I love your card...the silver/red colours are just lovely. This is awesome Jackie! Great color choice & design! Thanks so much for joining us at The Sisterhood’s ‘CHRISTMAS SPARKLE’ challenge and please come back again soon! great job jackie! i love that you made it so BIG!! Thanks for joining our challenge at Brown Sugar. Super cute card Jackie. Love the digi. Wishing you a great Christmas and a safe and Happy New Year.